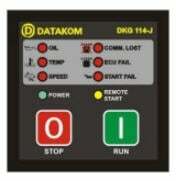 The DKG-114-J is a low cost engine control unit designed to start and stop electronic engines both manually and remotely. The manual control is made using the pushbuttons on the front panel. The remote control is made via the REMOTE START input signal. The unit connects to ECU controlled electronic engines through its standard J1939 CANBUS port providing engine control and protection without extra senders. It has the ability of engine starting and stopping with J1939 messages. The ECU alarms are displayed with appropriate leds.